Our lovely English Mummy, or Grandma as she is known to the boys had rather a special night out last week. Which she kept quiet and only told us at the last minute, modest mummy that she is. The BBC Somerset sponsored the inaugural Somerset Hero awards with the following guidelines: Nominations are open to people of all ages who may have overcome adversity, an illness, or perhaps have given something back to their community. Mark's Mum was nominated by one of her friends for the volunteer work she has undertaken with stroke victims at Yeovil District Hospital in Somerset. She goes along every week and supports and encourages those who have been recent victims of strokes. We know that her gentle way would be an encouragement in itself, but even more that that, sharing her own journey since suffering a stroke in August 2008 is a real motivation and gives others real hope for their own futures. To see Grandma now, you would never know that she had a stroke such has been her determination and hard work to get back the life she knew. And here's the link to the photos, with our lovely mummy at photo number 7 of the bunch. I'm keen to know if other lovely peeps out there who grew up in Christian homes remember these fabulous comic books and cassette tapes? I'm not sure what made me think of them, but one day recently they just randomly popped into my head. So in fact, I'm pretty sure it was God reminding me! I asked Nana & Poppa whether they still had them, and they were dusted off from out of a box and duly brought down to Gee Gee's when they visited her a couple of weeks back so that we could pick them up over Queens Birthday weekend. In the meantime, I'd had a search on the Internet for them, and was somewhat sad to see the original comics are out of print, but have been re-printed in updated versions which you can find here. While I was searching, I also came across a Christian Internet resource library called Max7. If you are in children's ministry or want free Christian resources for your own kids, you should definitely check it out! I contacted them to ask how to access the Jungle Doctor videos and cassettes they had listed on the site, and a wonderfully obliging girl replied to say that they were still in the process of building that part of the site, but that she would burn all of the stories onto DVD (they are still slideshows of the pages of the comics with the original audio cassette voice over accompanying it) and send them (from Aussie) to me for free. How totally awesome is that?!!!! Noah and I spent a good part of the weekend at Gee Gee devouring all the comics my mum and dad had found. We read about 'The Goat Who Wanted to Become a Lion' 'Safe as Poison' and 'The Great Wall' to name a few of the favourites. And the DVDs arrived from Australia this week too, so I have enjoyed cuddling up under the duvet with Noah these past few nights to watch them together. Each story has wonderfully simple Christian concepts captured in a story that kids can identify with. It certainly took me back to my childhood reading them all again! Happy happy memories. Saw this at Puke Ariki Museum last weekend in New Plymouth, and had to laugh. It made me think...did I suddenly get old and no-one told me?! We had one of these exact models, colour and all! Did anyone else have one of these lurking in their cupboard in years gone by? When I took this picture last weekend, all I could think of was that it looked like a scene out of a Dr Seuss book. Are ya with me? What a fabulous opportunity to hear sound advice from well-respected experts on parenting! Wishing you all a Blessed and Happy Weekend! I am also so in love and proud of Grandma. What a lady!!! That photo of Dr Zeuss tree, awesome. I have got some photos of similar trees and I remember thinking the same thing. How awesome for Grandma!! what an amazing woman. Yes, we used to have one of those vacuum cleaners too!! I even remember having one when my hubby and I first bought a house. Thanks for the link for Parent Centre webinars...def going to check those out. what an excellent retro vacuum cleaner! Oh the trees those truffla trees....I am off to knit my thneed! We had that same vacuum but in a kind of dull teal colour I think. Classic! 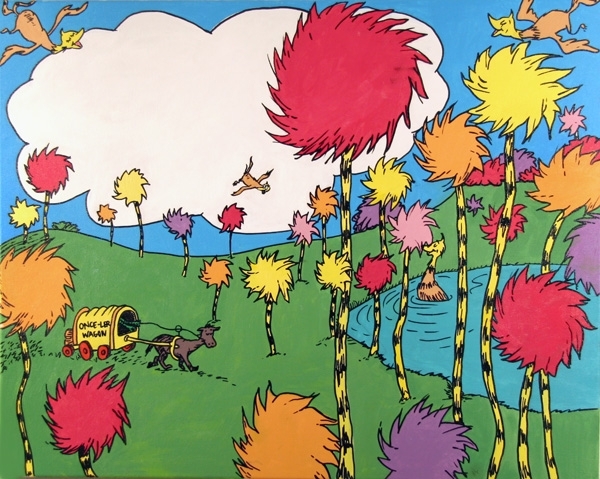 Totally with you on the Vacuum cleaner (snap) and the Lorax trees. I have yet to check out the Parents Inc Webinars - so thanks for the list! Grandma sounds awesome, yay for her! Oh my, that vacuum looks familiar! Wow - total flashback with the books and cassettes and the vaccuum cleaner!! Yay for your awesome Grandma - very insirational! Fabulous things to be loving! Awesome Grandma news and loving the sound of those comics. And that photo is definitely a Dr Seuss moment - ha, ha! Thanks for the Parent Inc. link - sound very interesting indeed and I must make for a couple of those. We so had that vacuum cleaner, and I am so Not that old! Don't remember those comics, we grew up on Psalty! 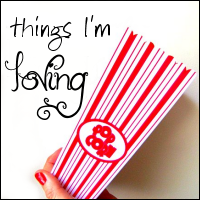 Another fabulous list of things to love. Wow! Way to roll Grandma - what an inspiring and worthy recipient! Awesome. Love that vacuum - don't have one, but growing up we had one at our bach. And thanks for the cool websites to check out. I am keen to look at that link for Kids ministry resources! thanks for the parenting palace link.. love ian and mary grant!